Constant innovation in kitchen products makes it interesting and exciting to stay up to date with culinary trends. New products are frequently being released, making it easy for you to find exactly what you need to create a sophisticated and smart kitchen. A new hot knife, a stylish pair of shears or a cutting board for your kitchen is all readily available through online retailers or at your local kitchen supply store. Displaying a few pieces of your new cutlery is a great way to change the look of your kitchen without too much effort. When you find the perfect, hot culinary knife, it does not have to simply be a practical addition to your kitchen. Although a sharp, quality knife is incredibly useful during meal preparation, it can also serve as an aesthetically pleasing piece. Wall-mounted magnetic strips provide a simple and affordable way to show off a single hot kitchen knife or a few select pieces from your collection. If you have an entire set of matching cutlery, try using a knife block both for storage and as an attractive focal point on your kitchen counter. 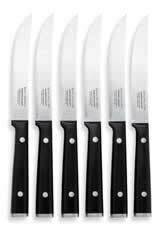 Knives are an indispensable part of any kitchen, but they should not be automatically relegated to hiding in a drawer or cupboard. Putting your new, innovative kitchen tools or knife collection on display in your home makes an impressive statement and provides a sharp, clean look.